The Net Return Pro Series is the only golf net in the world that automatically returns the ball back to the golfer. A Pro Series net can also handle golf ball speeds of 225 MPH with ease and is designed for years of use. 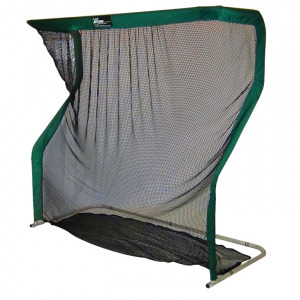 The Pro Series net can also be used for a variety of sports - with no modifications. Sports include Golf, Soccer, Baseball, Softball and Lacrosse. A Net Return training net offers a golfer unparalleled performance, premium quality, rugged durability and provides Instant Shot Feedback. Each and every Pro Series training net we sell is handmade, individually inspected and tested, and proudly Made in the USA. Stores and Transports Easily in convenient Duffle Bag (included). If you have any questions regarding the The Net Return Pro Series Golf Hitting Net, please give us a call, we would be happy to help you with any questions you may have. Write an online review on the The Net Return Pro Series Golf Hitting Net, and share your thoughts with others.